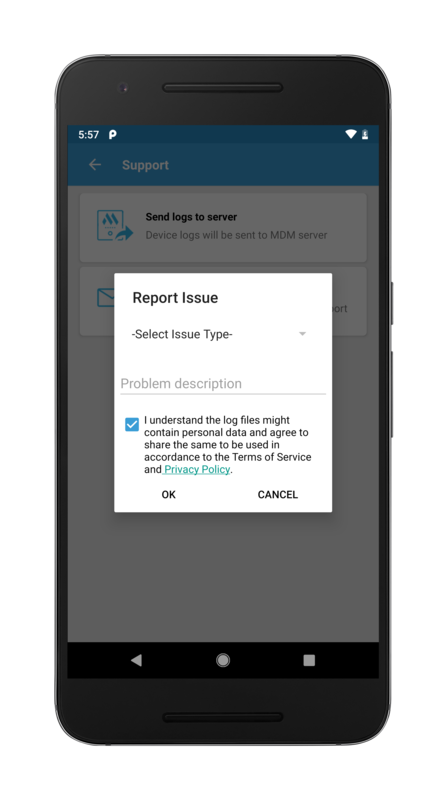 How to send log files to the Mobile Device Manager Plus support team? 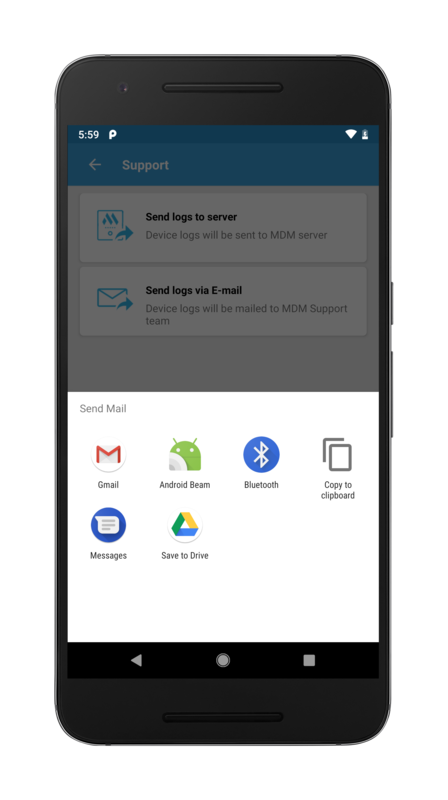 While working with Mobile Device Manager Plus, you might encounter issues which can be resolved quicker and better by the MDM Support team, if provided with the logs. MDM server logs is located in <Install_Dir>\MDMServer\logs. Navigate to the Support tab in Mobile Device Manager server. Click Send to send the support file. The log file(s) are successfully sent to MDM support team. The other option is to send the logs directly from the MDM app. Open the MDM app, click on the Support tab. To send logs to MDM support via E-mail, select the corresponding option. Provide the Issue Type, Problem Description if need be and select the checkbox before clicking on OK, to send it to the MDM support team. To send the logs to the server(applicable only for MDM On-Premises), select the option Send logs to server and follow the on-screen instructions. You can also upload the logs of Android devices managed by MDM. You can find the steps to archive the logs and the steps involved in sending it to the Mobile Device Manager Plus support. 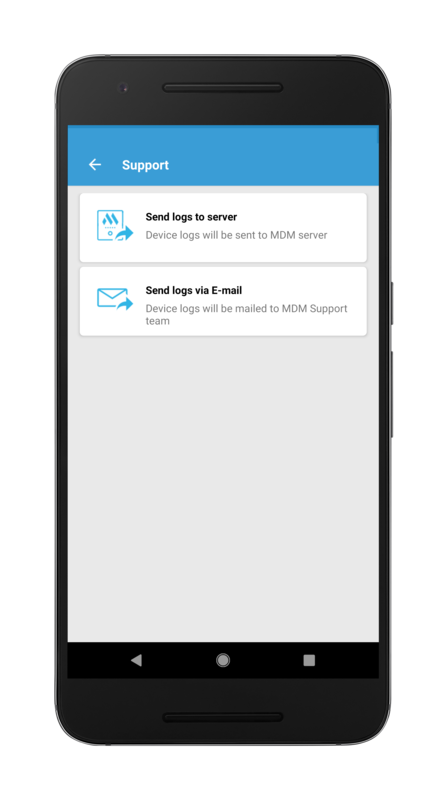 Open the MDM app on the device. Navigate to Device Details section. Navigate to Agent Log Directory. Note down the agent log directory: /mnt/sdcard/memdm/agent. Open the file browser in the device. Navigate to the location where the logs are stored. Navigate to the Support tab in the MDM server. Click on Create Support file. Select the Agent logs and specify the devices whose logs are to be sent. The log files are successfully sent to Mobile Device Manager Plus support. The users can directly send the logs from the managed iOS devices. Open the MDM app, click on the Support button. Select the email logs option and optionally enter the ticket ID and problem description and click Send. Follow the steps to extract the ME MDM App logs. Open the ME MDM App in the managed device. Select Collect logs. A notification is shown when the logs are successfully compiled. Follow the steps to send your logs to MDM support. Navigate to the Support tab in the MDM server. The log file are successfully sent to Mobile Device Manager Plus support. You can also upload the logs of the Secure Gateway configured with Mobile Device Manager Plus. Follow the steps given below to upload the logs from the Secure Gateway to the Mobile Device Manager Plus support team. Under Products, select Mobile Device Manager Plus. Specify the ticket ID, if you have one. Specify your e-mail address to receive notifications and other required fields. Click Add Files to browse and select all the files in ME_Secure_Gateway_Server\logs. The secure gateway server logs will be uploaded successfully.